Cluster mode is the solution for high performance system. It offers Load Balancing and High Availability features. A Platform cluster is a set of nodes that communicate via JGroups - UDP or TCP - in the back-end, and a front-end Load Balancer like Apache that distributes HTTP requests to the nodes. The High Availability is achieved in the data layer natively by the RDBMS or Shared File Systems, such as SAN and NAS. The following diagram illustrates a cluster field with two nodes (each node uses its local JCR index storage, but you can enable shared JCR indexing, as described in the chapter). Setting up eXo Platform cluster How to set up eXo Platform cluster. JCR index in cluster mode Configuration and explanation of JCR index strategies (local and shared). Activating TCP default configuration files How to use TCP default configuration files. Configuring JGroups via exo.properties A list of default values and variable names that you can configure via exo.properties. Using customized JGroups xml files In case you have a configuration that is not externalized, or you want to migrate your JGroups xml files from previous versions, read this section to activate your xml files. FAQs of clustering Common questions and answers that are useful for administrators when doing a clustering on eXo Platform. Install eXo Platform package by following Installation and Startup. If you are using eXo Chat addon, you should install it in all the cluster nodes. Create a copy of the package for each cluster node. Assume that you have two nodes: node1.your-domain.com and node2.your-domain.com. For testing or troubleshooting context, in case you are using Tomcat as application server and if you will run the cluster nodes in the same environment (same Operating System), you should configure different Tomcat ports. Configure the RDBMS datasources in each cluster node (follow this documentation) to use one of the supported database systems: Postgres, MySQL, MSSQL, Oracle, MariaDB. It is not possible to use the default configured hsql embedded database as noted in Configuring eXo Platform with database. The different cluster nodes must use the same RDBMS datasources. eXo Platform comes with Elasticsearch embedded. For clustering, you MUST use a seperate Elasticsearch process. Please follow the steps described here. IDM: datasource to store user/group/membership entities. JCR: datasource to store JCR Data. JPA: datasource to store entities mapped by Hibernate. Quartz tables are stored in this datasource by default. File storage data: Stored by default under a file system folder and could be configured to store files in JPA datasource instead. More details here. If the file system storage implementation is configured, the folder must be shared between all cluster nodes. The folder location can be configured by using this property exo.files.storage.dir=/exo-shared-folder-example/files/. It is possible to modify it through exo.properties file. JCR Binary Value Storage: Stored by default under a file system folder and could be configured to store files in JCR datasource instead. More details here. The folder location can be configured by using this property exo.jcr.storage.data.dir=/exo-shared-folder-example/jcrvalues/. It is possible to modify it through exo.properties file. Choosing file system or RDBMS storage depens on your needs and your system environment. (See more details in Comparing file system and RDBMS storage. JCR indexes: Stored under a local file system folder in each cluster node. More details here. 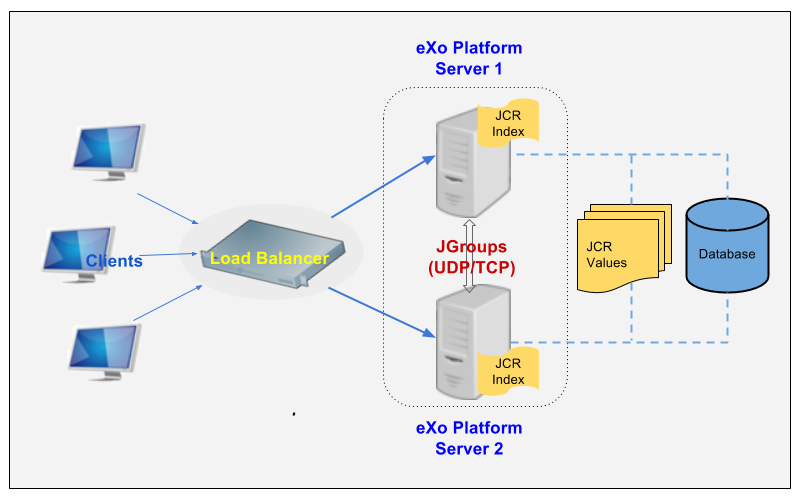 eXo Platform uses by default local JCR indexes and this is the recommended mode for clustering. In fact read and write operations take less time in local mode than in shared mode. Other systems: Such as MongoDB if eXo Chat addon is installed. eXo Platform uses UDP protocol by default for JGroups. This protocol is not recommended for production environements, you need to configure TCP as transport protocol instead. For that purpose, please follow this documentation. Configure CometD Oort URL. Replace localhost in the following examples with the IP or host name of the node. CometD is used to perform messaging over the web, and Oort is a CometD extension that supports clustering. The configuration is necessary to make the On-site Notification work properly. Configure CometD group port. This step is optional. CometD Oort nodes will automatically join others in the same network and the same group, so to prevent stranger nodes from joining your group, you might specify your group with a port that is different from the default port (5577). The situation is likely to happen in a testing environment. The default value for exo.cometd.oort.configType is “multicast”, and only the two values “multicast” and “static” are available. The parameter exo.cometd.oort.cloud must contain a comma-separated list of the Cometd endpoint of all the other nodes of the cluster. So in the example above, we assume that the node of this exo.properties is host1:port1, and that the cluster is composed of three nodes : host1, host2 and host3. # Default JCR indexing is local so you need to use a different folder for each node. # With the value below, you do not have to create the folder. Start the servers. You must wait until node1 is fully started, then start node2. In JBoss, you need to indicate the configuration file with -c option: ./bin/standalone.sh -b 0.0.0.0 -c standalone-exo-cluster.xml (.bat for Windows). -Dexo.cluster.node.name=a-node-name overrides the node name in the configuration file. This is useful in case you set up nodes in the same machine for testing. You will not need to configure the port for every node. Just use a different port-offset in each start command. If you run two nodes in the same machine for testing, change the default ports of node2 to avoid port conflict. In Tomcat, ports are configured in conf/server.xml. In JBoss, use -Djboss.socket.binding.port-offset option mentioned above. To configure a front-end for your nodes, follow Setting up Apache front-end. To configure load balancing, follow Setting up a load balancer. eXo Platform only supports sticky session mode for clustering (no session replication). This must be configured in the load balancer configuration. eXo Platform uses local JCR index by default. You can switch between local index and shared index by configuration. Local indexing: Each node manages its own local index storage. The “documents” (to be indexed) are replicated within nodes. “Documents” are Lucene term that means a block of data ready for indexing. The same “documents” are replicated between nodes and each node locally indexes it, so the local indexes are updated for the running nodes. There are additional mechanisms for a new node that starts for the first time to initiate its local index, and for a node joining the cluster after downtime to update its local index. Read this link for details. Shared indexing: Every node has read access to a shared index and has its own in-memory index. A single “coordinator” node is responsible for pulling in-memory indexes and updating the shared index. It allows searching for newly added content immediately. However, there are rare cases that search result is different between nodes for a while. Set the index directory (exo.jcr.index.data.dir) to a network sharing path. The default protocol for JGroups is UDP. However, TCP is still pre-configured in platform-extension-config.jar!/conf/platform/jgroups and you can simply activate it. The files contain externalized variable names and default values for TCP. In case you want to use TCP instead of UDP, it is recommended that you activate those files and, if you need to, change the default settings via exo.properties. See Configuration overview for the exo.properties file. JGroups configuration is externalized for both JCR and IDM. In this section you find a list of default values and externalized variables that you can configure via exo.properties. See Configuration overview for the exo.properties file. It is recommended you configure JGroups via exo.properties. Only when the variables are not enough, or when migrating from previous versions you want to re-use your JGroups xml files, you will customize JGroups xml files as described in next section. See how to activate TCP default configuration in Activating TCP default configuration files. JGroups configuration, for both JCR and IDM, is externalized via exo.properties (see Configuration overview for this file). It is recommended you use this file. See previous section for list of default values and externalized variables. Only when the variables are not enough, or when migrating from previous version you want to re-use your JGroups configuration files, you will follow this section to activate your xml files. Put your xml file somewhere, typically standalone/configuration/gatein/jgroups/ in JBoss and gatein/conf/jgroups/ in Tomcat. In which exo.conf.dir is standalone/configuration/gatein in JBoss and gatein/conf in Tomcat by default. If you put your files somewhere else, pay attention that you must use an absolute path after “file:”. This configuration must be adapted to you specific needs before you go to production. Diagnose a cluster problem can be difficult. The Apache logs can be customized to help you to follow the load balancing behavior. The BALANCER_WORKER_ROUTE will add in your logs the name of the node that received the requests. The BALANCER_ROUTE_CHANGED will set the field to 1 if the user was redirected to different node compared his previous request. This indicate the node was removed from the cluster pool or was not able to received more requests. During normal processing, this flag should always have the value -. The load balancing support on the free version of NGINX is limited. The sticky algorithm is limited to ip hash and the nodes configuration can’t be precisly tuned. Q: How to migrate from local to the cluster mode? Update the configuration to the cluster mode as explained above on your main server. Use the same configuration on other cluster nodes. Move the index and value storage to the shared file system. Q: Why is startup failed with the “Port value out of range” error? This problem happens under specific circumstances when the JGroups networking library behind the clustering attempts to detect the IP to communicate with other nodes. The host name is a valid IP address, served by one of the network devices, such as eth0, and eth1. The host name is NOT defined as localhost or 127.0.0.1. Q: How to solve the “failed sending message to null” error?